Very few recreational skiers wax their skis enough. Big deal you say? I don’t want to go fast anyway? Wrong on both counts! Don’t fall into the trap of thinking that wax isn’t a key factor in ski performance. Don’t fall into the trap of thinking that once a year is enough. Don’t fall into the trap of thinking that waxing skis regularly is not an important part of ski maintenance. Waxing is important to you for multiple reasons. Waxing makes skis glide more evenly and smoothly through the different types of snow we encounter on each run. You have all probably experienced the obvious sudden jolt of hitting a slush puddle, but did you consider that minor variations of this happen all the time on every run? Waxing minimizes this effect and makes us better skiers—and skiers who are having more fun! Waxing is also good for your skis’ general health. Ski bases accept wax not just onto the surface of the base but into the base, which keeps it from drying out. Just as your skin dries and becomes chalky and flaky if it is too dry, so your ski your bases have the same needs. A base that gets too dry will develop furry feeling texture that makes it sticky and grabby on the snow. This makes it harder to ski well. This can be fixed, but it will cost you. A new wax job alone will not repair this damage. The ski must be stone ground to cut past the damaged surface. If left too long, the base can even dry out to the point where it can shrink and pull away from the edges, which allows moisture to seep into the ski’s core the next time you ski. This can ruin your prized skis. “How often do I need to wax my skis?” is a good question with a tough answer. Most of our employees check our bases every ski day and wax after most ski days, but we admittedly are gear geeks. You really need to wax every 1-10 ski days depending on snow conditions. Wet snow has a more abrasive structure that leads to more frequent wax needs. Fluffy dry powder snow may mean you do not have to wax for a dozen days or more. How can you tell if your skis need wax? The best tip is to get a good visual feel for your bases. A freshly waxed ski will have a rich deep black look. As wax dissipates, it will look less black and more dull and chalky. If it looks gray instead of black it should be waxed asap (areas near the edge usually show this first). If it looks very gray and has a light fuzzy texture instead of smooth, it is long overdue! A real hot wax is done with an iron. It takes at least 20 minutes to do it right. Prolonged exposure to heat will open up the porous base and drive wax deep into it. Cooling, scraping, and buffing are important components of a hot wax. Many resorts and shops advertise “hot wax” specials for about $5. This usually entails running your skis over a roller that runs through a vat of “hot wax”. Often you stand on the skis and simply glide over the roller right on the slope. Not necessarily a bad thing, but not a “real” hot wax; really more of a “topical” wax treatment. This is typically the stuff that gets rubbed or sprayed on the ski base without the use of heat. Buffing it in will help but this really only puts a coat on the surface. Topical waxes certainly have their place but for the average Joe, this is not a substitute for a hot wax. TIP: Topical waxing every day will prolong the durability of a hot wax and will save you time and money in the long run. We built a “hot box” a few years ago to deliver the best wax penetration possible. While a standard hot wax uses heat to drive wax deep into the ski, the hot box is simply the next step. Wax is generously applied to the base and the skis are then placed into a heated storage box for an extended period of time. Multiple sessions are sometimes necessary to fully penetrate the thickness of the base. The final product is a base that is fully saturated with wax. While this is a necessity for racers to remain competitive, many of our recreational customers have become addicted to the process. You can surely tell the difference! There are many different brands and types of waxes out there. Unless you do your own work don’t worry about it. Waxing with a candle is probably better than not waxing at all in most cases. For most tunes and hot wax work we use a universal wax which is pretty good for general California conditions other than spring skiing (see below). Racers have their own deal which is based on speed. No need to address that here. What is of importance is spring condition waxes. We have special waxes to deal with sticky California spring snow. 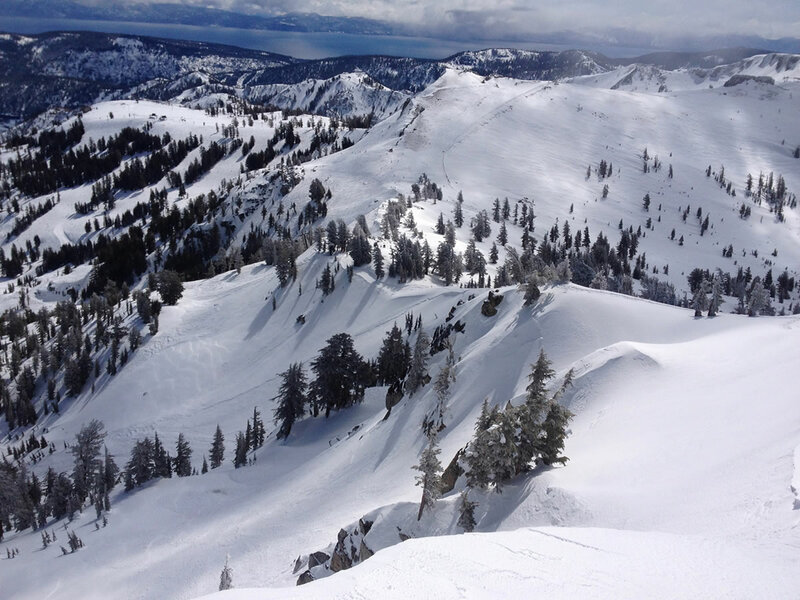 If you are going to ski in California when the weather is warm, come by. We can recommend some special “juice” to make your day soo much better! This is the most simple of tech tasks and can save you lot’s of $$$; we encourage all skiers to consider doing wax work at home. IMPORTANT: We feel that waxing at home is easy and critical to your skis’ health and well being. To that end, we are happy to meet you at the end of our business day and give you a live demonstration free of charge. Better yet, bring your own skis and for the usual fee we will let you do the work yourself (with instruction of course). Talk about a win-win situation! Just call ahead and we will make the time. Clean ski bases using a citrus based wax remover/ski base cleaner. Heat wax with iron until it melts in drips onto the base. Hold wax to iron above ski. Cover approximately 40% of surface with drips. Smooth wax onto the base with the iron – allow it to penetrate while keeping the iron moving. Add more wax by dripping where necessary. Don’t heat non-waxy base for too long. Cover entire base. Turn off wax iron and allow the wax to cool and become part of the base. Scrape excess wax with plastic scraper – most will come off. This is okay; we want only a thin layer on top of the base (actually, the wax is mostly inside the base). Once excess wax is removed, buff with a structure brush to remove uneven areas and provide structure, which breaks suction. If a second coat of temperature-specific or fluorinated wax is desired, apply coat 2 after scraping excess the first time.